Albion, PA — Rueben Schwartz, President of Schwartz Construction Ltd., a construction and excavating contractor located in Conneaut, Ohio, considers his large fleet of construction vehicles the key to providing his clients with reduced costs, faster response to the job site and higher operator experience over companies who depend on rental equipment. But he discovered, after the second breakdown of his new lowboy trailer, that his fast response time was only as good as the trailer that hauled his equipment. Although he had been conscientious about loading the trailer safely and within the weight limits, the trailer deck’s mainbeams did not hold up when driven over rugged off-road conditions. Schwartz chose a Rogers® Tag-Along 25XXL, 25-ton capacity, triple axle trailer. The model features a 22´ deck with a 6´ beavertail and an 8º angle for safe, easy loading of a wide variety of equipment. Standard features include a two-speed landing gear, adjustable pintle eye, ABS and spring brakes on all axles, larger tires for increased GAWR, rubber-mounted sealed beam lights with modular wiring harness, US DOT-approved conspicuity markings and an extra-long drawbar for improved axle load distribution. All Rogers Tag-Along Series models are designed with tough unitized frames and heavy-duty spring suspension for a smooth, stable ride. 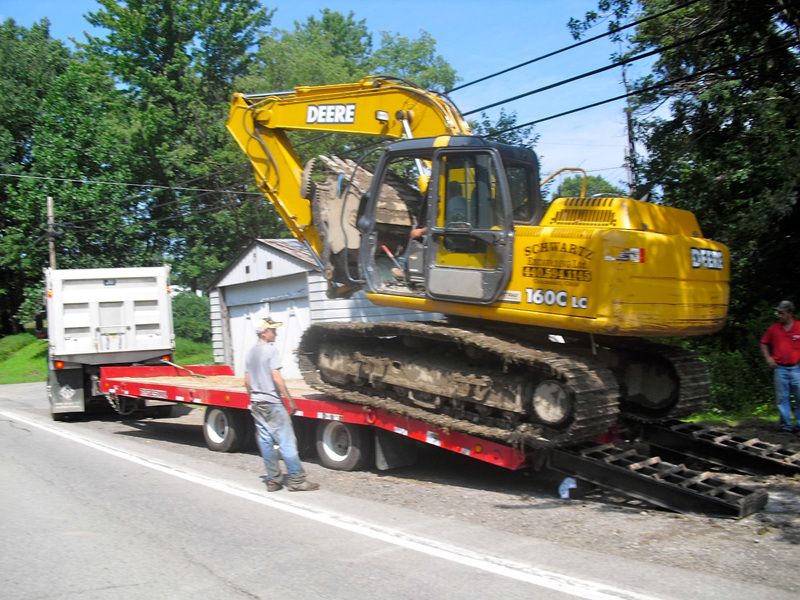 Rueben Schwartz regularly hauls a 160 John Deere track hoe and a 750 John Deere dozer on his Rogers® TAG25XXL trailer.